Remote desktop connection broker helps to load balance RDP remote session connections, increase performance, disaster plan for the terminal servers, publish apps based on the permission, restrict user access to the terminal server, monitoring, server load balancing etc. RDCB – Broker server maintains database and manages the sessions. 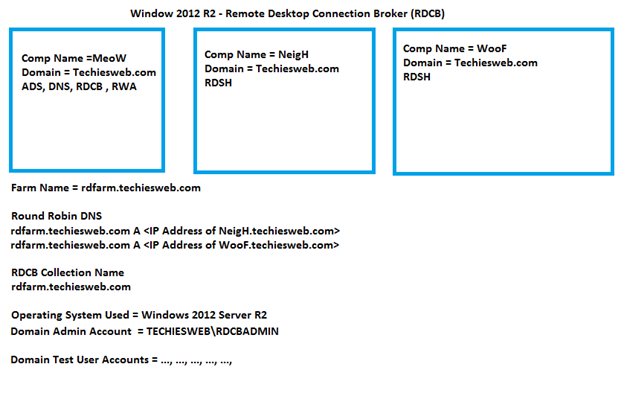 RDSH – Remote desktop session servers. RDW – Published applications accessible through web URL. Divide the entire process into 5 areas. Round Robin – DNS host entry creation for RDSH. Installation of RDCB, RDSH and RDW. Create new collection pool for the new broker farm. Publish Remote Apps in RDW. Testing the RDCB and RDW deployments. This session explain the creation of Round Robin DNS entries for RDSH servers. Create new DNS host A entries that points only to the RDSH hosts. Here I used the farm name “rdsfarm.techiesweb.com”, which points to NeigH and WooF.